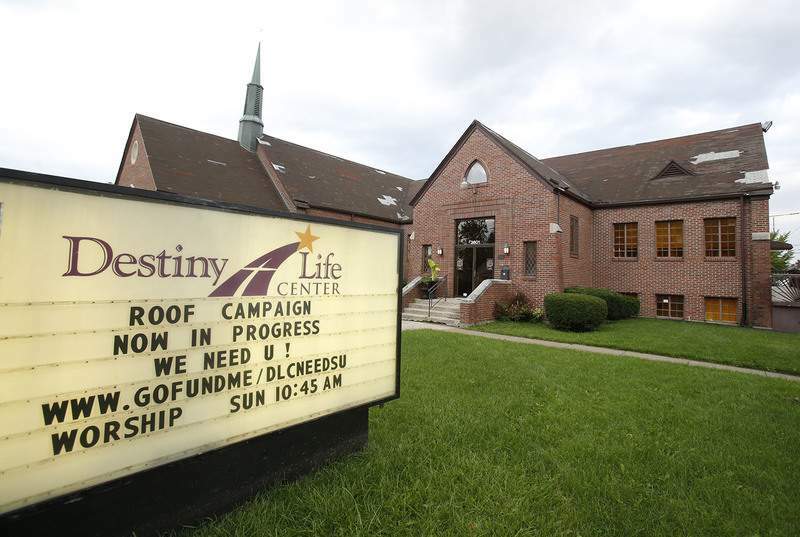 Chad Ryan | The Journal Gazette Pastor Karen Staton of Destiny Life Center Church is trying to raise enough money to put a new roof on the building, which may be left uninsured otherwise. But she is determined to keep serving her troubled south-side neighborhood. Chad Ryan | The Journal Gazette Destiny Life Center Church on Warsaw Street started as a Lutheran church is 1937 and has been owned by Pastor Karen Staton’s parents since 2006. It is also the site of Victory House, a shelter for homeless women. 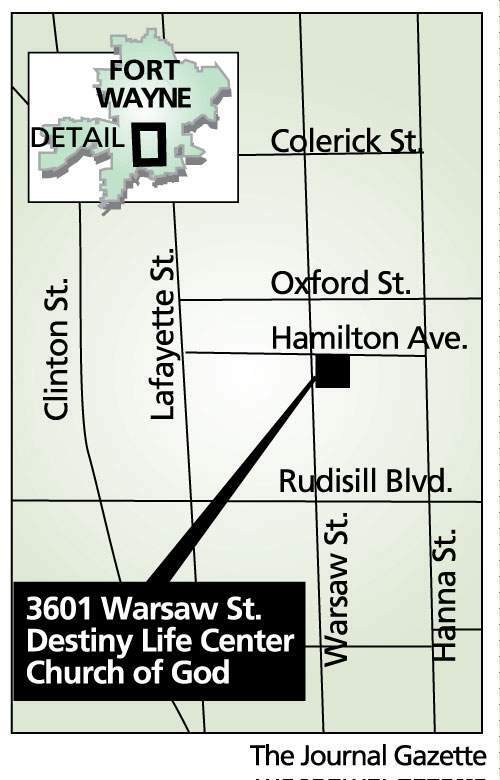 Destiny Life Center Church sits on Warsaw Street, in the heart of a war zone. At least that’s what Pastor Karen Staton calls it. Gunshots can be heard all times of the day and night. In the middle of a Sunday sermon, she might stop long enough to sense whether the shots are close or far away. Staton is committed to carrying on the Church of God her parents, W. Doyle Staton Sr. and Birdie Staton, started when they were called to pastor in Fort Wayne in 1989 at McKee Street Church of God. The couple founded Victory Fellowship Church at 3601 Warsaw St., which evolved into Destiny Life Center Church of God. 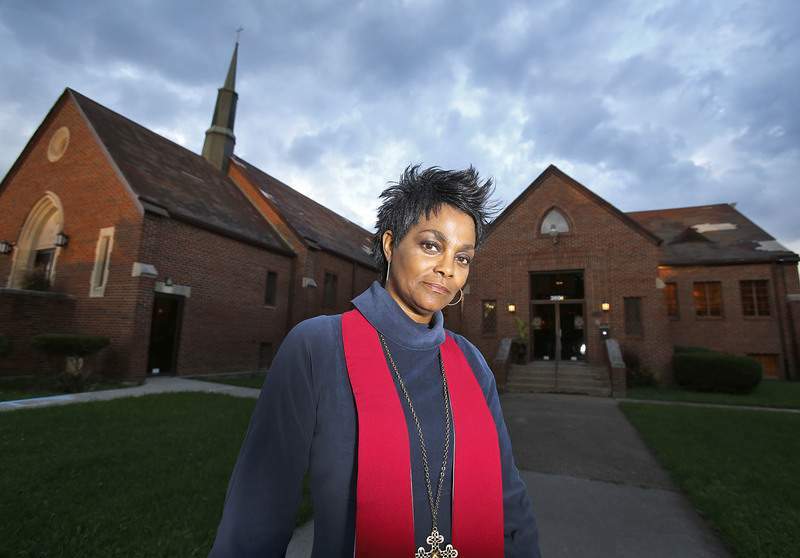 It is a neighborhood church serving residents who live in the troubled area, she said. The ZIP code for the church, 46806, is a nine-square-mile area with about 25,000 people. The median household income and median house value fall significantly below the state average, according to city-data.com. There’s plenty of opportunity for ministry, but in March, Staton and her small congregation of about 40 members got some bad news. The church’s Carmel-based insurer, Selective Insurance of the Southeast, wrote a letter warning that the building would not be insured past March 2017 unless the roof was replaced. The roof has lost shingles and has been patched and repatched for the last 10 years until there is nothing else to be done but replace it, Staton said. Joe Cockrel is an account executive at the DeHayes Group, the Fort Wayne-based insurance agents who hold the church account covered by Selective. Cockrel said the roof would have probably been an issue with any carrier. Cost for a new roof for the 32,000-square-foot building would be about $30,000, a cost that Staton says the church cannot afford. If the church were shut down, it could also mean an end to some church missions. One is a food voucher program that Staton’s parents started in 1998 with the Community Harvest Food Bank. There’s also a prayer line that started 17 years ago. Five years ago, Staton started Thirsty Thursday, an open mic evening service open to the community. The word, as the sermon is called, is often preached by guest female pastors. Perhaps the most meaningful ministry for the community is Victory House for Women, a two-story home on East Jefferson Boulevard provided by Staton herself to house and help homeless women. Patti Jae Jimerson, Staton’s assistant pastor, oversees the operation, which has helped nearly 140 women get back on their feet since 2010. Victory House opened when the economy crashed in 2008. Women who lost their jobs and became homeless needed to develop new skills. Others have come with substance abuse problems and were court-ordered to Victory House, Jimerson said. They all participate in programs at the church. Neither Staton nor Jimerson take a salary for their work there. Staton, who is divorced, works in adult foster care. Jimerson, who is married, works as an Uber driver. While the Victory House mission would continue even if the church were forced to shut its doors, its operations would be hurt and the community would be at a loss if the church were empty. Marsha Holmon, who was a resident at Victory House, said the church "keeps me literally alive. I’ve had some things happen in my life, not the best things. They give me hope and encouragement." Hattie Moore said the church "lets people just come in off the street. There’s no judgment here. Nothing but love." Children stop by in the afternoon and weekends, particularly if they see Jimerson’s or Staton’s car in the parking lot. On a recent early evening visit, three neighborhood sixth-graders ran inside the church and slid into the pews to talk to Jimerson about their day and their hopes and dreams. One boy said he was going to be a football player, while another said he hoped to be a policeman. "I’m there every day," said Staton who became the lead pastor in June 2015. "They come knock on the door. They need groceries. We give bread. … We would not be able to have the presence in the neighborhood if we were not in the building. We really do support that neighborhood. We serve the underserved. "With all of the shooting and with all of the unrest, we’re right now smack-dab in the middle of the madness," Staton said. There are times when gunfights erupt and shooters chase each other down the alley behind the church. "We kind of listen to see what we hear. If we’re hearing any commotion, we look out and see what’s going on. Nobody wants to get hit by a stray bullet," Staton said. In the past month, one man died from gunfire on Warsaw Street, and since June, at least three homicides occurred within walking distance, Staton said. The stepmother of one young man who lost his life to gunfire came to ask Staton whether she could hold his funeral there. "We actually have funerals there for people who don’t have a church," Staton said. But because of water problems in the church basement, the repast – a traditional dinner held after a black funeral – could not be held, she said. The roof may be the building’s most crucial problem, but there are others, too. The church, built as St. Luke’s Evangelical Lutheran Church in 1937, was enlarged in 1952. Next door is the former Ward Elementary School, now an alternative school in the Fort Wayne Community Schools system. In 2006, Staton’s parents were able to buy the church when two Lutheran congregations merged, leaving the building unused, Staton said. She and her brother Warren Staton Jr., took over running the church, while her father, a one-time Allen County jail chaplain, became pastor emeritus. In August, Staton opened a GoFundMe account called "DLCNEEDSU" to raise money for roof repair. Roofer Sam Lengacher of Grabill has promised to start work when Staton and her team raise half or $15,000. As of last week, the church has raised about $9,000, Staton said. Lengacher, one of the Amish "brothers," as Staton calls him, said roof leaks have forced the closure of one room, and buckets are strategically placed in the church when it rains. The two-layer roof is probably 20 to 25 years old, he estimated. Staton had hoped the Anderson-based Church of God would offer financial help, but said they declined. Doug Talley, executive state pastor for the Church of God Indiana Ministries, said in an email response he was not aware of any roof problems. In a phone interview, he spoke on behalf of Jeff Matas, state pastor of church health for Indiana Ministries, who came to the church twice a couple of years ago but couldn’t recall talking about building problems or an exit strategy. Talley said the Church of God is a group of autonomous churches and that the main office does not have a lot of money to help churches with building issues. Staton said Matas did suggest an exit strategy. But she and Jimerson have no intention of abandoning the neighborhood. Staton has dreams of opening up a Montessori preschool at the church and buying up homes on the street to extend the homeless ministry. But for now, the roof must be fixed.